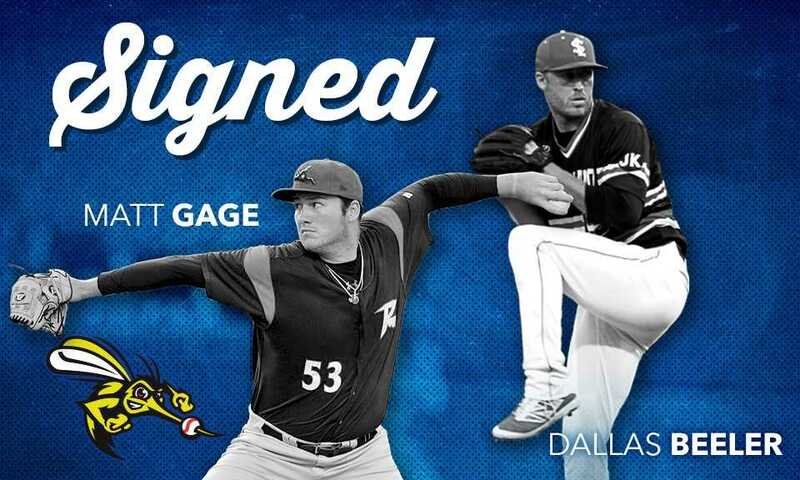 SUGAR LAND, TX— The Sugar Land Skeeters today announced that they’ve re-signed former Major League right-hander Dallas Beeler and have also signed left-hander Matt Gage. Both pitchers appeared in Saturday’s win over the York Revolution, with Gage starting the game and getting the win after allowing two runs through five innings and Beeler throwing three scoreless innings of relief. Beeler is scheduled to start Thursday’s series finale against the Revolution. Beeler, 29, became the ninth player from the 2018 Skeeters to have his contract purchased by a Major League organization, which leads the Atlantic League, when the Kansas City Royals purchased his contract on July 6. The nine contracts purchased from Major League organizations also matches the franchise record originally set in 2013. Since the Skeeters joined the Atlantic League in 2012, the most contracts purchased by Major League organizations was 13 from the Somerset Patriots in 2017. Beeler went 0-2 with a 13.50 ERA in four appearances (two starts) with Double-A Northwest Arkansas before being released by the Royals organization on July 23. Beeler won the Atlantic League’s June Pitcher of the Month after going 5-0 with a 1.61 ERA through six starts in the month. At the time his contract was purchased, Beeler was second in the league with a 1.99 ERA, tied for first with six wins, first with a .165 opponents’ batting average and fifth with 54 strikeouts. In a June 3 start against the York Revolution at Constellation Field, Beeler struck out 10 batters, which was a single-game high for a Skeeters pitcher this season and were tied for the second-most single-game strikeouts in franchise history. In his final start with the Skeeters, which came on June 30 at Constellation Field against the Lancaster Barnstormers, Beeler tossed eight no-hit innings, which marked the longest no-hit bid by a Skeeters pitcher this season. The Chicago Cubs drafted Beeler in the 41st round of the 2010 MLB Draft out of Oral Roberts University. The Toronto Blue Jays also selected Beeler in the 37th round of the 2008 MLB Draft out of Jenks High School (Jenks, Okla.). Beeler made his Major League debut with the Cubs on June 28, 2014, and also appeared with the Cubs at the Major League level in 2015. In two Major League seasons, Beeler has gone 0-3 with a 6.05 ERA through five starts, spanning 19 1/3 innings pitched. Beeler has seven of his seasons at the affiliated level with the Cubs and one with the Royals. He missed a majority of the 2016 season and all the 2017 season after undergoing flexor tendon surgery and ulnar nerve transposition surgery. Through 119 career appearances (101 starts) at the affiliated level, Beeler has gone 31-31 with a 3.88 ERA, striking out 368 batters to 156 walks over 559 innings pitched. Gage, 25, has spent the 2018 season thus far with Triple-A Sacramento and Double-A Richmond (San Francisco Giants) and went a combined 4-9 with a 5.47 ERA in 15 appearances (14 starts), spanning 75 2/3 innings pitched. The San Francisco Giants drafted Gage in the 10th round of the 2014 MLB Draft out of Siena College and he's spent all five of his seasons at the affiliated level within the Giants organization, peaking at Triple-A. Gage has gone 27-34 with a 4.03 ERA in 101 career Minor League appearances (506.1 IP), striking out 381 batters to 123 walks. The Skeeters will be holding their first Fans For Cans food drive for Wednesday night’s game against the York Revolution, which starts at 7:05 p.m. Fans who bring at least five canned food items to Constellation Field will receive a voucher good for free admission to any remaining Wednesday home game this season. All canned food items will be donated to the Houston Food Bank. The Skeeters wrap up their seven-game series against the Revolution on Thursday and it will be Thirsty Thursday at Constellation Field, featuring $2 beers and sodas for all fans in attendance.